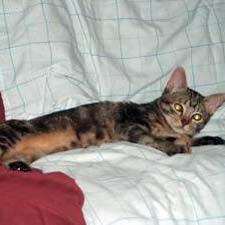 The Sokoke stands out for its long legs and short, dense coat with a blotched tabby pattern that ranges in color from a warm light brown to dark chestnut brown on a sandy background. Almond-shaped amber to light green eyes peer out from a small head that’s topped with ears always set on alert. A long, thin, stiff, whiplike tail is banded with broad rings. A variety called the “snow Sokoke” has a cream to grayish-beige blotched tabby pattern with stripes on the legs and tail, a facial mask and blue eyes. The independent but loving Sokoke bonds closely to its people and will “talk” to them for hours. This is an active and intelligent cat that responds well to training, including walking on a leash. Too active to sit passively in a lap for any length of time, the Sokoke is more likely to follow its people throughout the day, always ready to be involved in whatever they’re doing. The Sokoke is social and gets along well with other cats and dogs. The Sokoke is generally healthy. The Sokoke is sheds little but enjoys being brushed. The Sokoke is a rare breed and may be difficult to find. The Sokoke is native to Kenya, and the name Sokoke is a reference to the area where they were found, a rainforest on the Kenyan coast. In 1978, horse breeder Jeni Slater discovered a litter of the kittens on her property and raised them as pets. One of Slater’s guests, Gloria Moeldrup, became interested in the cats and took a pair home to Denmark, where she began breeding them. Although they have a wild appearance, resembling a cheetah or ocelot, the Sokokes’ DNA identifies them as domestic cats. The Sokoke is accepted for championship status in Federation Internationale Feline (FIFe), as well as by The International Cat Association (TICA), Canadian Cat Association (CCA) and United Feline Organization (UFO).